Lewis Hamilton (5th, 1:40.126): "Every year it has been relatively difficult for us in Singapore, so we knew that we would come here and it would be tricky. I thought Red Bull would be as quick as they were, but I didn't anticipate Ferrari to be that strong. I gave it everything today but I could not get any more out of the car, I squeezed it until it was dry. There are no points for today, so we will focus on doing the best job we can tomorrow and remain hopeful. But this is a horrible track for overtaking; it will be a long race. I will have to try and see if I can get a good start to pick off at least one car. Sebastian has Verstappen next to him, so anything can happen at the start." Valtteri Bottas (6th, 1:40.810): "So far, it's been a difficult weekend for us. We're clearly third quickest around here, that's just not enough. We've been chasing the setup of the car and made big changes yesterday and today, but we still haven't found the optimal setup. You can see it in the lap times that I can't really drive the car with the setup that we've got. We were a bit surprised by how big the gaps to Red Bull and Ferrari are. Two weeks ago, we had a great weekend in Monza and now we are really struggling. The result today highlights that we still have issues producing enough downforce and mechanical grip on a track like this; it's an area we clearly need to work on. We know our pace alone isn't enough to score a podium tomorrow, so we need a clean race, a good strategy and bit of luck as well." James Allison, Technical Director: "That was a very disappointing qualifying session with both cars. We knew this would be a tough weekend for us but we had nevertheless hoped for better. It was clear that we didn't have the pace to compete for pole today. Now, we have to put this result behind us and start to think about how we can limit the damage tomorrow, or perhaps better still make the most of the opportunities this track routinely creates on race day." Toto Wolff: "Days like this are the tough ones. We know that our car is not at its best on these tight circuits and Lewis extracted the maximum today from the package we had. It looked close at certain stages of the session, and we kept hoping for a little bit more, but it's never nice to see a gap like that in black and white on the timing screens. The end result, with three cars between Sebastian and Lewis, obviously makes the situation even more difficult; likewise, Valtteri has been some way off Lewis this weekend, never really feeling confident with the car, and we need to dig down into why that is. The challenge now is simple: to extract the maximum possible from tomorrow's race, grabbing every opportunity that comes our way. It will be a long, tough race for everybody." Max Verstappen (2nd, 1:39.814): "All weekend has been a good build up, getting faster and faster and finding a smooth rhythm so to come away with second is a really good result. I took a little bit of risk to put down a good lap as we had predicted the others would improve from yesterday and this morning's sessions. Perhaps there was a bit of time in the last sector to find but in general I am very pleased with how the car and I performed. That was the best balance in terms of set-up I have had with the car in Qualifying all year and that is a big positive. My quickest time was more or less the maximum I could do, Sebastian just had an even better lap. Race pace is good so we have a chance tomorrow but it looks like Ferrari have found quite a lot. The start will be important and maybe if there are a couple of safety cars that could impact the result too." Daniel Ricciardo (3rd, 1:39.840): "I really thought I could get on pole position today so I'm a bit disappointed to be honest. Seb's last lap was strong and we couldn't run with that. That pace was good for us in Q3 and it seems like he did most of his time in the first sector. I didn't really know what else we could do. If we get the start right tomorrow then we can put some pressure on him through our strategy. I still believe we have a good chance to win this race. I do enjoy a street circuit and the challenges that come with it, brushing up against the walls and all that. I feel I can do this lap after lap for two hours tomorrow and still hold my concentration. I really want this one so hopefully that hunger prevails tomorrow." Christian Horner, Sporting Director: "A very strong qualifying performance from both of our drivers. Max and Daniel have been showing great speed around the streets of Singapore all weekend, and indeed we've topped every session apart from the final one that counts in Q3, where Sebastian put in a great lap. Starting second and third on the grid gives us strategic options for tomorrow in what will be one of the hardest grands prix of the year. It's great to have both cars right up there and we are looking forward to a hot and humid race tomorrow night." Sergio Perez (12th, 1:42.246): "It was a difficult qualifying session. All the way up to my final run in Q2 I was struggling with the front end of the car. We made some changes which helped the front, but I lost rear grip instead. I'm not really sure what went wrong so we need to look into the data to really understand why we didn't deliver tonight. It's going to be a long and tough race tomorrow, and we need to be patient. We are only a couple of positions away from the top ten so we will fight for as many points as possible." Esteban Ocon (14th, 1:42.760): "It's been a disappointing day for the team - the first bad qualifying session in quite a long time, actually. It's not something we want to see, obviously, but sometimes that's the way it goes. I felt comfortable with the car until qualifying, but the track evolution went away from us. I struggled under braking and it was very easy for me to lock the fronts. We now need to focus on trying to recover in the race. Points are still very much possible, even starting in P14, so we will just go for it. There has been a 100% record of Safety Cars here over the years so there may be opportunities. Our car is better in the race than in qualifying and it's my birthday tomorrow so I really want to get a good result for me and the team." Robert Fernley, Deputy Team Principal: "We certainly didn't deliver on our potential today and, as a result, we have missed out on the top ten. Sergio struggled with rear grip, while Esteban didn't manage to deliver a clean lap in Q2. It's a shame because grid position is very important on this circuit and we face a big task tomorrow to bring the cars back up into the points. However, like any street circuit, there are likely to be incidents and opportunities that we need to use to our advantage. The race pace is strong and both drivers are determined to make up for the disappointment of today's qualifying session." Felipe Massa (17th, 1:44.014): "It's been a very frustrating day to be honest. On my first run I had big oversteer, I hit the wall and got a puncture. I was lucky enough to have the problem at the last corner, before the pit entrance, so I changed tyres and went out again. Unfortunately, I had big oversteer in the last corner on my next run and lost half a second, and the chance to go into Q2. I am very disappointed because today Q2 was possible. These mistakes are frustrating and every day of this weekend has not gone well. We will try everything tomorrow and hopefully it can be a different day." Lance Stroll (18th, 1:44.728): "I didn't get everything out of myself, and so I am not happy with the session and myself. Coming into it I predicted more grip, so I locked up and touched the wall. It was a scruffy session, I needed to risk a lot to try and get into Q2, but instead I just went backwards. The track was changing so much and it was very different to all the other sessions this weekend. We just really got it wrong, but for sure the car is not as good here. It is frustrating going from the front row to the back. We had some hopes to get into Q2, but the pace was really not there. We are just missing a lot and that is going to cost us until we fix it." Paddy Lowe, Chief Technical Officer: "The circuit evolution in Singapore is normally very high but today was particularly extreme because of oil put down from one of the earlier support races. That certainly caught Lance out. He's already on a learning curve at the circuit so despite three attempts on three new sets of tyres, he didn't manage to set a good enough time to get out of Q1. In Felipe's case, unfortunately he hit the wall on the exit of Turn 21. This was probably promoted by the oil that had been put down at the entry to Turn 20, so that lost his first-timed lap. Luckily, the damage wasn't too extreme, although it was a very big hit. The car had survived with minor damage which we repaired. Felipe went out for the second run and that would have been good enough for P13 at that stage of qualifying, but he had a big oversteer moment in the final corner sequence, which lost him about half a second. With an evolving track, I'm sure Felipe would have been in a position to improve in the later sessions, as did everyone else, so it is unfortunate that we missed the cut for Q2. I think the car had better pace than we showed today. We will see what we can do tomorrow. We can still race well, it's a long race that is usually filled with incidents. Cars and drivers suffer a lot in the final half hour so if we can hang on until the end, and be in a good state, there's still potential to score points." Fernando Alonso (8th, 1:41.179): "The first target of having both cars in Q3 has been achieved, so 50 per cent of the job is done. Now our second target is to get both cars in the points tomorrow, which I think is possible from these starting positions. Race pace here is always a bit of a question mark; it's difficult to read. Yesterday's long runs were not long enough and, added to the difficulty of overtaking on this track, positions will be more or less set after the first lap. That means we need to concentrate on making a good start and having a clean first corner. After that. I'll keep focussed and not make any mistakes. It is a very demanding race but hopefully we can bring some points home. The first six cars are too far away in terms of race pace, so our aim will be to defend our positions and possibly climb up to seventh. I hope we can complete the job tomorrow." Stoffel Vandoorne (9th, 1:41.398): "We came into the weekend more or less expecting to get both cars into Q3, and we achieved that today. We were always on the pace throughout Q1 and Q2, but perhaps we lacked that little bit extra in Q3 compared to our rivals. But nonetheless it's been a smooth and solid effort from the whole team. While today is a good starting point, tomorrow is where it really matters. I might be hoping for quite a few Safety Cars in the race, but I still think we can conclude the weekend on a high." Eric Boullier, Racing Director: "This is a track that we knew would play to the strengths of our package, so it was pleasing to see our drivers pushing the limits right up at the sharp end of the field. Getting two cars into the top 10 today sets us up well for what is always a difficult, demanding and unpredictable race. We hope to come away from it tomorrow with more valuable world championship points. Fernando and Stoffel have both driven outstandingly well all weekend, and it was a joy to watch them attacking this difficult and uncompromising street circuit. Likewise, the whole team has performed at an extremely high level throughout this busy Singapore GP week - whether that's been in the sweltering pit garage, the hospitality suite or back at the factory. When these things come together, it's worth emphasising that, as a race team, we operate as a singular unit, and it's days like today that remind us what we can achieve together when we have the merest sniff of a competitive package." Yusuke Hasegawa, Honda: "Both drivers started the day well with a solid performance in FP3, leaving us feeling positive about our car heading into qualifying this afternoon. Fernando and Stoffel then maintained their momentum, and were both able to successfully go through into Q3. Although we knew this was a circuit more suited to our package, it is still good that we were able to show some competitiveness and secure top 10 grid slots for the race. Despite this, we can still see a gap to the frontrunners so we will continue to make further improvements. We think we have decent race pace, but it's very difficult to overtake at this track, so if we can get away well at the start we can hopefully be in the fight for points." Carlos Sainz (10th, 1:42.056): "I'm very happy with making into Q3 today! If I say the truth, after yesterday's FP2 and today's FP3 we didn't look that competitive and I thought that Q3 was a bit out of hand for us today, but in the end we managed to put a very good lap together - the pace came back in qualifying and I'm very satisfied! We now need to think about the race because it's not going to be easy. Unfortunately for us, a few of our closest competitors are quite a big step ahead of us here so it will be a race more on the defending side tomorrow, looking in the mirrors, but I'm up for it and will try my best to keep this point-position!" 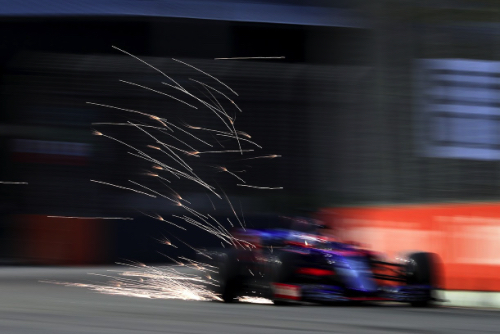 Daniil Kvyat (13th, 1:42.338): "The start to my qualifying wasn't that bad - I had one run in Q1 which was particularly good, but then in Q2 the track evolved and the car just got worse. I felt it sliding everywhere, had a lot of understeer and I just didn't manage to warm up the front tyres, which is all quite disappointing. This is something we have to analyse, because it's very frustrating for me. Regarding tomorrow, it's hard to say what we can do as we haven't had much pace this weekend. We just need to do our race, follow a good strategy and see where we end up." Jonathan Eddolls, Chief Race Engineer: "This is a track where it's all about giving the driver a consistent car, lap after lap, because there's an awful lot you can gain from the driver at a street circuit like this one. The main focus of FP3 was to build on what we learnt on Friday, fine tune the balance of the car and really focus on and understand the tyres. Track conditions here change significantly from session to session - they start in daylight and then you qualify when it's dark, so it's a lot about data gathering and analysis and the guys have done a really good job in getting their heads around the tyres. FP3 was therefore spent trying to understand what was going to be best going into Qualifying, which pretty much went to plan. It was great to get one of the cars into Q3. Carlos did a great job and managed to build it up throughout the session. We were a little bit tight on the timing on the very last run - I think we crossed the line with only five seconds to go - so it was a little bit nerve-wracking at one point, but he kept his head down and put in a good lap. Unfortunately, with Daniil, he didn't quite feel the grip on his very last set in Q2, so we'll spend this evening trying to understand the reasons for that. We also had a small issue in Quali where a small amount of oil found its way into the exhaust system and ignited, causing the plume of smoke you saw as the car entered the pit box. These conditions were quite specific so we have no concerns with reliability for tomorrow. Starting from P10 and P13, there's definitely the potential for a good result here tomorrow." Romain Grosjean (15th, 1:43.883): "As long as you do your best in qualifying, that's the most important thing. I think from both of us it was the maximum we could've hoped for. We pushed pretty hard but, unfortunately, we don't have much balance here. I'm sure we're going to learn a lot from this weekend for the future but, of course, when you're deeply into it, it's a bit painful. From yesterday we've made some improvements. I'm proud of the work. It's a long race, a tough race. Hopefully, the car will work better tomorrow. We'll aim for the best strategy, maybe we can get lucky with a safety car, and try to get to the front somehow." Kevin Magnussen (16th, 1:43.756): "I don't think Q2 was out of reach. I caught a Renault in the last corner of my last lap, which cost me the margin I needed to get through to Q2. It's been a tough weekend. We've not been strong enough, but we'll fight anyway. It's hard to say how the race will go. We'll wait and see tomorrow." Guenther Steiner, Team Principal: "I think that was the most we could get for us this weekend. The midfield is so tight. We know a lot of things can happen here on a street circuit. Let's see what happens. For sure, we will try our best to get into the points." Pascal Wehrlein (19th, 1:45.259): "I did the best job I could during today's qualifying. My laptime is quite alright considering that I lost some time by slightly touching the wall. As a team, we are all working hard to make progress." Marcus Ericsson (20th, 1:45.570): "It was a difficult qualifying for me. I had to abort my first stint, and return to the garage early-on to pick up a fresh set of tyres. That made for a tricky start to Q1. In the end I only managed to complete one decent flying lap. It was a disappointing qualifying. Let's see what is possible in tomorrow's race."